KUALA LUMPUR: A total of 53 projects are in active consideration by the Government for potential investments worth US$97bil, representing 45% of the total investment value targeted under the Economic Transformation Programme (ETP). 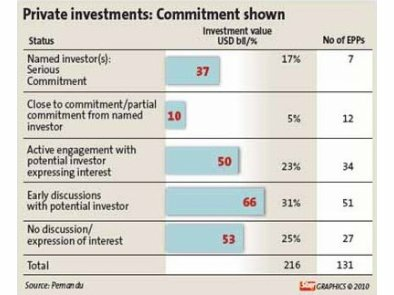 Topping the list for 131 entry point projects (EPPs), which have an overall investment value of US$216bil, are seven potential investors that have shown serious commitment for EPPs worth US$37bil. One of the key projects targeted under the greater Kuala Lumpur plan is the mass rapid transit rail proposal, the brainchild of MMC Corp and Gamuda Bhd. Further details of the EPPs will be revealed on Sept 21, the open day for public feedback and consultation with Pemandu, the Performance Management and Delivery Unit in charge of coordinating and monitoring the ETP. Public sessions in Kuching and Kota Kinabalu will be held on Oct 4 and 7 respectively. Among the sectors identified for further development under the high income growth model are oil and gas, energy, palm oil, financial services, tourism, business services, electrical and electronics, wholesale and retail, education, healthcare, communications content and infrastructure, agriculture and greater KL. According to Datuk Seri Idris Jala, Minister in the Prime Minister’s Department and CEO of Pemandu, domestic direct investments are projected to account for 73% of total private investment. Among the potential benefits are the generation of an additional 3.3 million jobs, the GNI impact per public dollar spent of seven times as well as personal and corporate tax revenue potentially hitting US$36bil to US$40bil. “Commitment from the private sector is strong,” Idris said at a press conference yesterday. “However, in the past, the public and private sectors have not sat down to talk about this.” Of the total amount of funding required, about 92% was projected to come from private investment (32%, or RM144bil, from government-linked companies (GLCs), and 60%, or US$266bil, from non-GLCs). Despite the major role played by domestic investors, the Government will embark on roadshows to attract foreign direct investments. “There are 60 business opportunities for which we hope to get help from foreign direct investors,” said Idris. Public consultations represent the third stage in the preparation of the ETP, which is to be published next month. Its progress will be tracked after that. In May, workshops were organised to identify sectors that could be national key economic areas, following which growth targets were set. By the middle of the year, the projects that would drive GNI growth in 11 sectors and the greater KL region were identified, together with the funding, investments and manpower requirements. © 2015 Megaharta Real Estate Agency. All Rights Reserved.